This recipe comes from celebrity chef Francis Mallmann whom I’ve discovered thanks to Netflix Original Documentary Series “The Chef’s Table”. He’s the Argentine god of fire and I’ve cooked a lot from his cookbooks Seven Fires and Mallmann on Fire. And if it wasn’t for him, I never would have thought to put these two flavors together in all the world of combinations: On one side the tapenade so briny, savory, and aromatic, on the other the ever-so-mellow boiled potato. Who would have thought that they’d be any good together? Thankfully Chef Mallmann did and he had the fortitude to put it in his cookbook for me to find. I love me a good potato, especially charred in a hot pan with a nice crust on the outside. And tapenade? I’m such a sucker for the dark and weirdly shining black famed black olive spread from Provence. I’ve been known to use a spatula to glean the remains from any given jar that crosses my way. I love that stuff so much. The two flavors marry in the most unusual way. It’s humble and basic dish but at the same time so fantastically loud. Sharp and fragrant through the bite of olive but soft in the way only a perfectly boiled potato can be. Are you ready to make a little noise in your kitchen? Smashed Potatoes with Tapenade Print this recipe! 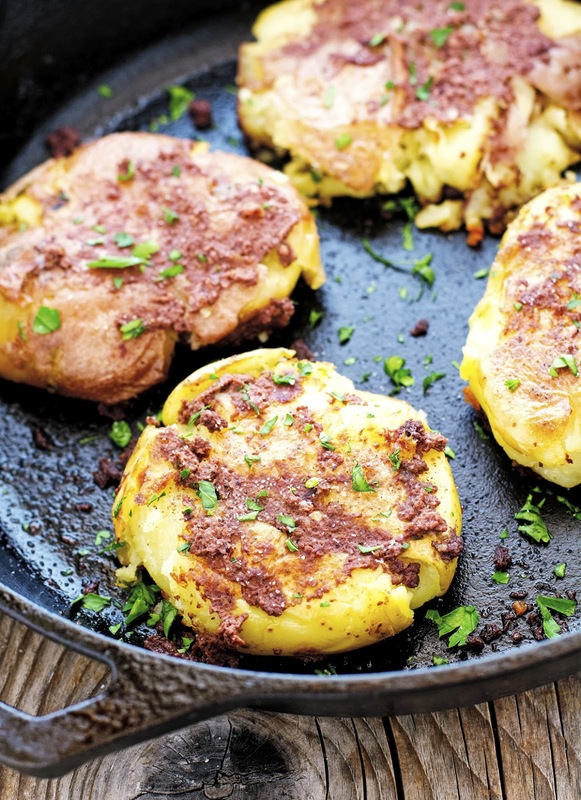 *Use all-purpose red, yellow, white potatoes for this, not Russets. Put potatoes in a large saucepan with vinegar, bay leaf, peppercorns, and water to cover. Bring to a boil, reduce to a simmer, and cook for about 12 to 15 minutes, or until the potatoes are tender enough to be pierced with a skewer. Drain potatoes in a colander but do not allow them to cool, or they will break instead of smash. Place warm one potato in a dishcloth on a hard surface. Slowly and gently crush the potato using the palm of your hand. Transfer to a try. Repeat with the remaining potatoes. 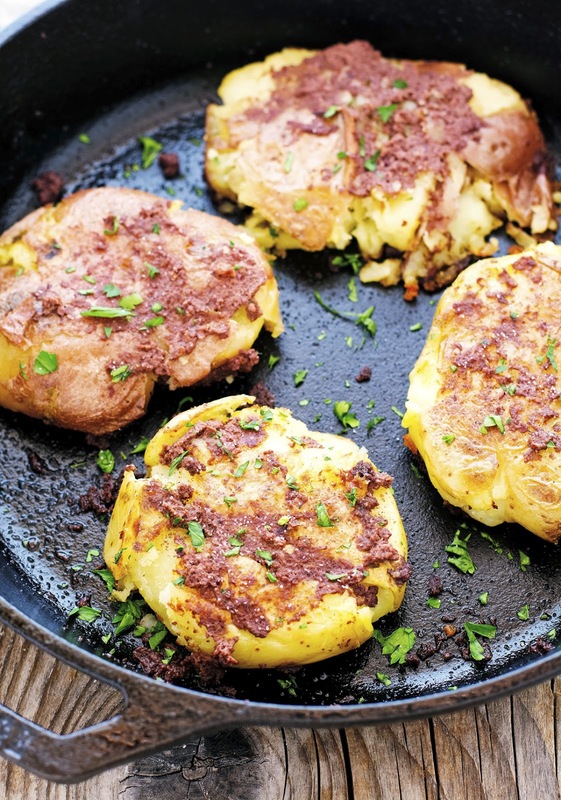 When hot, place potatoes in the skillet and cook without moving for about 5 minutes. Using a wide spatula, transfer potatoes to a plate crisp side down. Spread uncooked side with 1 tablespoon of tapenade, and press it down lightly into the potato. 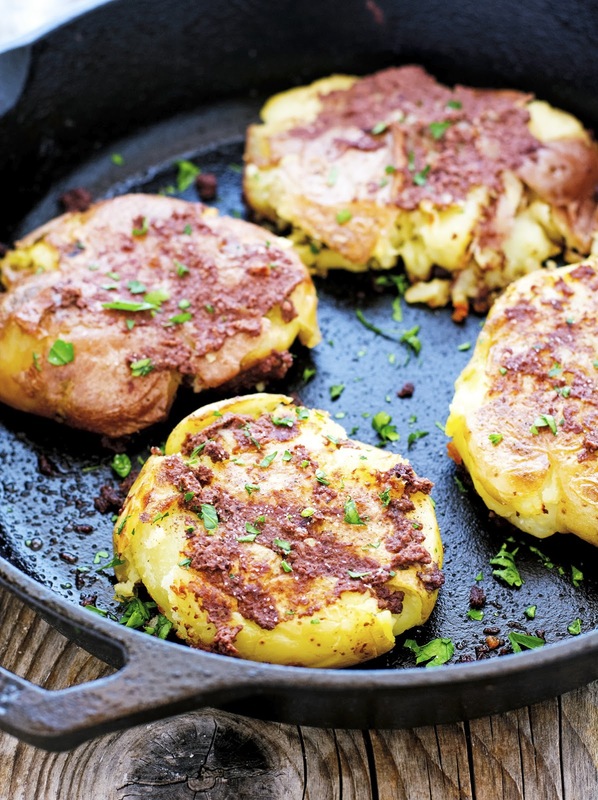 Slide the spatula under the potato and with one quick move, flip the potato over onto the skillet (tapenade side down). Spread 1 teaspoon of tapenade over the potato. Repeat with the remaining potatoes and brown them for about 5 to 7 minutes. Sprinkle with a bit of salt and chopped fresh parsley to taste and serve immediately! One potato yields 145 calories, 3 grams of fat, 28 grams of carbs, and 5 grams of protein.